Hey Tampa! Hope everyone had a fantastic Thanksgiving! Remember a few weeks back when I posted a wonderful recipe from the Seasons 52 Grill? Well in that post I mentioned that I would be posting another recipe shortly…and it is now that time! 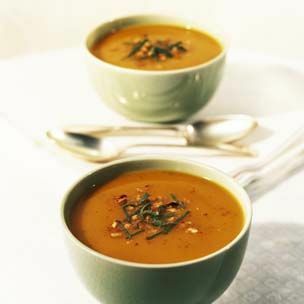 This time I will be giving you guys all the instructions on how you can make their Roasted Butternut Squash Soup. • 1 ea Onion, Spanish, peeled and diced ½"
Now that you’ve got all the stuff you’ll need, follow the steps below. • Gather and measure all ingredients. Wash and prep veggies, cut squash in half, lengthwise and spoon out seeds. • Place squash halves and apples on foil-lined cookie tray, cut side up. • Combine sugar and cinnamon and sprinkle mix evenly onto squash. • Roast squash halves in 350º oven for 45 to 60 minutes until tender. • Cool at room temperature for 30 minutes until able to handle. • Scoop pulp from skins. Reserve pulp for soup. • Heat oil in soup pot at medium heat. Add apples, onion and ginger. • Sauté for 5 minutes until tender and sweet. • Add vegetable stock. Stir in cooked squash pulp. • Simmer on low heat for 15 minutes. • Add Tabasco, honey, and salt. • Puree fine in a blender until smooth. • Garnish with apple slivers, sour cream, chives, and toasted pumpkin seeds. Sidenote: If you want to ensure you get every little last drop out of the honey jar, make sure to microwave it for 10-20 seconds. If you’re thinking this is going to make a lot of soup, you’re thinking right! This recipe will serve 6 to 8 people so make sure to invite your family and friends over to test out this delectable creation and remember to thank our friends at Seasons 52 for sharing a fantastic recipe with us! And of course, remember to keep looking back here for more about Tampa and Tampa Bay Area events.